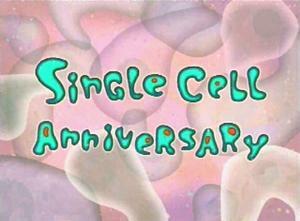 Single Cell Anniversary (Episode) – From SpongePedia, the biggest SpongeBob-wiki in the world! Single Cell Anniversary is an episode from season 6. Plankton walks to the Chum Bucket stink ing with the stench of "failure" as he calls it, and Karen is in a very happy mood. Karen then smells Plankton and gives him a bath, taking off his skin, which is revealed to be his clothes. After he's washed, Plankton learns that it was his and Karen's wedding anniversery, and that Karen got him a copy of the Krabby Patty secret formula for his present, but he can't have it until he gets her a present. While Plankton is looking for a present, he runs into SpongeBob. He tells SpongeBob the news and SpongeBob yells to all of Bikini Bottom that there's a "Love Emergency". SpongeBob then tells Plankton that his present has to come from the heart, and he suggests a serenade. Plankton then remarks that he can't sing, and SpongeBob takes him to the pineapple and works on Plankton's vocal cords. Plankton sings so high that he breaks the glass Squidward was drinking out of, and he breaks Sandy's helmet so she has to run for air. Then, Plankton goes off to serenade Karen. Plankton walks into the Chum Bucket and starts singing a mariachi-style song, and SpongeBob and Patrick play guitars in the background, wearing Mexican-style clothing and mustaches. Plankton also shakes maracas. Karen cries when it is over, and then she starts uploading the Krabby Patty secret formula. SpongeBob is mad at this, and he unplugs what he thinks is Karen, but was just the coffee maker. Karen finally uploads the formula, but she starts crying again, and she breaks down and shorts out, leaving Plakton still without the secret formula. She then shuts down, and the EMILP (Emergency Mother-In-Law Program) uploads and starts nagging, saying that Karen could have married the ATM, someone with money. This episode marks the first song with lyrics since Atlantis SquarePantis. Lots of specifications are revealed about Karen, such as the fact that she has 256 GB of RAM. Karen's family is referred to as applications (her mother in law can be accessed). SpongeBob mentioned the Windows OS key command CTRL (Control). - Alt (alternate). - Del (Delete). This key command opens the Windows Task Manager. However, in Windows 95, 98, Utopia, NT 4.0, Plus! and Whistler 2257, Ctrl+Alt+Delete is a log-in command. This key command does nothing in Windows 3.1 and Chicago. A game based on this episode can be played at SpongeBob.com. Pian-Oh-No! is based on Plankton trying to impress Karen. This is the first and only time for "Love Emergency". We find out that Karen goes "DING!" at least one time every day. Also, "Ding.wav" is a sound file in Windows 95. How can Karen's tears come out of the computer? They would stay in the computer (this was proven in Chum Caverns)! Why would the Krusty Krab just let Karen in? They do know she's the W.I.F.E of Plankton. Why didn't Karen take the formula before? It's the first time Karen turns on her "E.M.I.L.P." First time an ATM is mentioned. If the formula was in a bottle, then why didn't Plankton just let karen give him the bottle instead? Patrick is absent from most of this episode but appears randomly during the song. This page was last modified on 19 April 2011, at 21:55. This page has been accessed 29,787 times.